I was agitated, angry and sad in other words full of disruptive emotions! I was walking my dog wondering how I would or could communicate about what I perceived as a lie. I heard a radio interview hailing a work travelling the world that consisted of dead human bodies, infused with plastic and propped up in strange positions ‘as if’ they were “doing” some kind of activity e.g. skiing. Body Worlds was touted as a work of Science and even as Art and most horrifically to me, as Educational. As I walked the dog I turned to follow the sweep of the path which led to ‘my’ tree. There were five mature maple trees lining the upper edge of a curving hillside. These trees overlook the expanse of the Cedarvale park. “My” tree was the second one. The particular form of her branches became a great comfort to me when I recognized them from a distance. I had decided some months earlier to experiment. I read a book called “Nature Spirits and What They Say” by Verena Stael von Holstein where through conversations with places ( e.g. an old Mill) substances (e.g. Salt) and aspects in nature such as a marsh the beings of these conveyed their experiences/consciousness, their particular point of view. They were communicating so that Verena understood what they meant, each had a unique ‘grammar’ or way of connecting thoughts and words. Verena describes the experience as connecting with the place that comes before words and concepts!!! For my experiment I chose one tree. I knew I would visit with some regularity as it was in the park where I often walked my dog. What would happen if I turned my attention to this one tree every day with the same kind of inner interest and warmth that I carry into a conversation with a friend? Of course there would be a period of getting to know each other. I looked forward to that. I took careful notice of all of my sense impressions, objects in the environment, encounters with people, animals, and sounds. I decided that I would observe everything as if it was “speaking” to me. I would arrive each day and lean my back up against the trunk. I had learned that approaching trees in this way respected the shy nature of the tree spirit. The first week of my new friendship there were various surprises. My foot caught the edge of something on the ground , “Another piece of garbage”, I thought. I would always pick up any garbage I found on my walks so I bent down to pick up this clear plastic shape and when I saw what it was I laughed aloud – it was a form for a plaster cast – the shape in this case was an angel – wings and head – as it turned out I had this exact relief in plaster, and it had been given to me many years ago and it had some significance. Syncronicity. The next day I greeted “my” tree and sat down on a bench that was placed conveniently on the other side of the path . I could meditate and close my eyes to concentrate on making a connection with the tree. As I was about to sit my eyes caught sight of some graffiti sprayed onto the back support of the bench. There were small musical notes also sprinkled around the words… The words read “In glory singing praises” again I laughed. I had “seen” this bench hundreds of times and this writing had never caught my attention if, in fact, it had been there before. I took these sweet and “real” outer world “things” to be a response to my intention and attention. They had an aura of magic and a great beauty concealed within the ordinary, even what could be considered “ugly”, expression of human activity –i.e. graffiti or garbage. Back to the day where I was so shattered by the little voice of a five year old girl saying on the National Radio “I learned that bodies have plastic in them and can do lots of stuff…” The broadcaster came on afterwards praising the educational value of the exhibit. 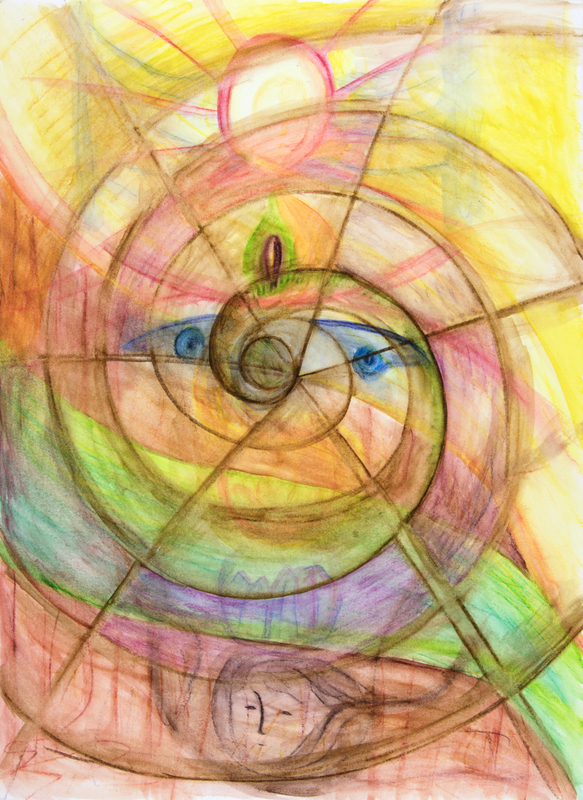 I ‘shared’ my distress with the tree, asking “How can I communicate what is missing – what is wrong with the THINKING behind this work…?” Then I was aware of “thinking” or perceiving a series of very simple and direct images. The first image was of a living tree. It was cut down. It was transported inside a large building and made to stand erect by means of an elaborate mechanical support which required time, resources and human engineering. Then each leaf is dipped in a plastic, hardened and attached one leaf at a time to the branches. Then a group of school children are brought in, walking in a straight and orderly line. An adult gestures towards the tree. This is the “lesson” on trees. All of this took place in a flash. It came as IMAGE and I immediately laughed out loud. It was brilliant, simple, clear and even humorous. Tree jokes!! It contained irony. How could that be? My mood shifted and I went home to write a letter to the radio program with this image described in the letter as a starting point to make my plea for some sense about what a child would and would not take from exposure to “Body Worlds”. I was astonished at the efficient and direct communication by this tree. My encounters continued. I often arrived with strong and turbulent emotions to this tree friend and was comforted and soothed . I received what I might call good advice . I was moved to offer the tree a gift… I asked the tree what it would like from me as a gift… The response I was given was a plea for “Art” “What kind of art?”, I asked. What materials, what form? The response “You’re the artist”…so I pondered this and pondered it but could not come to a satisfactory conclusion. I was aware each time I visited that my promise was not yet fulfilled. 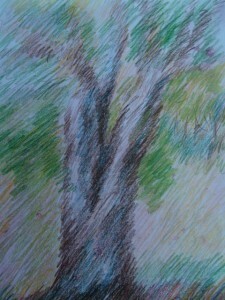 I decided to just do something so I brought my sketch pad and some coloured pencils looking deeply and carefully at every nuanced shape, the branching, the shape of the canopy, the protruding roots, the texture of the bark – I appreciated the individual unique beauty of that tree. Again I asked what kind of art? No response. In fact I felt a bit of a sullen silence. This might be strange to say as we experience the silence of trees as a given… There are the subtle sounds of rustling leaves or branches creaking in big gusts – or rain dripping off the canopy…where outer silence gives over to inner conversation, where meditative visualizations, the metamorphic panorama of images, thought and feeling take place in the hidden heart that is where the trees become like thunder beings – awake and changed as is the air is in a storm with great burgeoning thoughts and imaginations. I flailed about trying to understand the tree’s request for Art – I decided in the meantime to make a gift, even feeling that it somehow didn’t really fulfill the invitation. 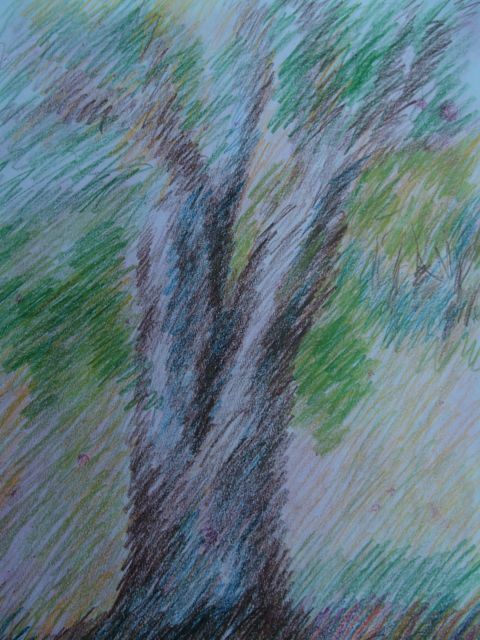 At first I just tried sketching the tree (the two attempts shown). But that did not seem to satisfy the request. Then I gathered my jewelry-making tools and copper wire. I selected many large, beautiful beads. Some were semi-precious stones, others hand-carved seeds or wood, others one of a kind handmade clay beads, some colourful glass beads. I made two single strands that I intended to join onto the tree branches. I decided to attach them to the tree when the park was most likely to be empty…I brought an ladder, my beautiful copper creation, some pliers and wire to attach it to the tree. As soon as I entered the park I an older Scottish woman who I often met on morning walks in a different park came up to me. She was my father’s neighbour . She immediately saw my strange accessories (not easy to conceal a ladder) and she asked me what I was doing. I said without too much thought – “Well, I am an artist and I’ve made a gift to give to a tree”. She looked perplexed trying to find a concept in her worldview that resembled anything I was describing… She said something politely and went quickly on her way. That was not exactly what I had in mind in terms of surreptitiously giving the gift to the tree. Then as I turned the corner around a small hill where that I could see my tree across the bowl of the field I noticed a police car parked in the lot next to the field…what? Is it possible that what I was doing might be considered vandalism? Then I arrived at the tree and sitting on the bench opposite (which was empty most of the time) there was a young man and his dogs. My goodness…what I felt was being conveyed was that this work could not be done anonymously but had to be witnessed and done openly. Much like our experience of trees themselves – we ‘see’ them – and may even love them – but these alternative and deeper aspects of tree nature are not noticed nor acknowledged. I arrived at the tree and set up my ladder. I found a lovely place where the branches met and assembled the ‘branchlets’ so there were two loops gracing the place where the branches joined. It looked beautiful – elegantly harmonizing with the form of the tree and also catching the eye . I folded the ladder and went home. My son was visiting a week later and I was excited to bring him to see the tree adorned with my gift. I had the feeling it could be a wonderful work to adorn trees in this way all around the world! When we arrived at the tree I saw the branches bare and empty of any ornaments. The branchlets were gone. I was saddened…wanting to share it with my son, wanting the tree to have that gift eternally and wondering what kind of intention was behind the removal…yet I knew that the way I reacted in front of my son was important. Was I going to be attached through the egotism of my own small deed? Some days later I was telling my mother what happened. She dismissed my worry and said with firm certainty,” Oh never mind dear the gnomes have taken the branchlets and they are very pleased with them!” Well I don’t know although I am reminded that even though there was not an outer ongoing presence of my little creation, the deed was done and that could not be undone. I continued to wonder. What did the tree mean that I was to give a gift of Art?